We have had many requests for this center finder from Vicmarc. 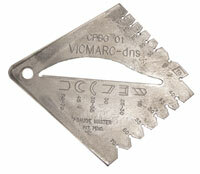 It is made of cast aluminium and has notches along the edge for checking the angle of your tools. Angles between 15° and 75° are set out in 5° increments, Recommended angles for different turning tools are cast into the jig for easy reference.